It was a dream come true for members of the various Community Development Associations (CDAs) surrounding FUNAAB as history was once etched on the sand of time with the commissioning of the much awaited Police Divisional Headquarters at Harmony Estate, Alabata Road. Speaking at the Commissioning, the Ogun State Commissioner of Police, (CP), Mr. Ahmed Illiyasu commended the efforts of everybody who contributed towards making the project a reality. 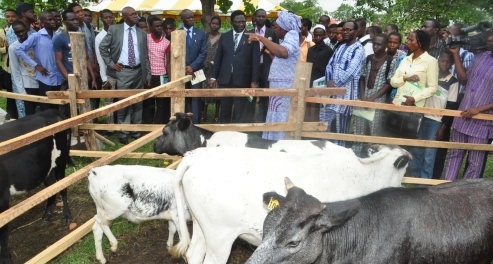 He thanked the Management of the Federal University of Agriculture, Abeokuta (FUNAAB), describing the Institution’s act as “a new revolutionary move in Community Policing”. According to the CP, FUNAAB’s role and gesture towards building the Police Headquarters is “the First of its kind in Nigeria”, enjoining other tertiary institutions in the country to emulate it. To further entrench the Police-Community-Students’ relations around the FUNAAB and its adjoining communities, the Commissioner of Police disclosed that the Command will create the Police Community Relations Committee (PCRC), Students’ Chapter, adding that the first of its kind will start from FUNAAB. He said, with the PCRC Students’ Chapter in place, the Police outfit will work with the Students’ Union Government and the Student Affairs Division of the University, assuring that “Community/Peoples’ Policing have come to take root in Ogun State. Addressing the elated gathering, the Vice-Chancellor, Professor Kolawole Salako appreciated all stakeholders, from the community leaders to the Police formation and students for witnessing the commissioning. Professor Salako stated that the genesis of the Police Divisional Headquarters had its roots in the crises that took place within the University and its environs in August, 2016. The Vice-Chancellor advised the Police that in making use of the place, they should ensure that innocent students are not punished, because, according to him, “students can be vulnerable”, while he frowned at students being criminalized. Advising the students, Professor Salako pleaded with them to behave properly and within the ambit of the law, as he or his administration will not support criminality. He equally charged the community leaders not to rest on their oars, by leaving the entire policing job for the men of the Police Force, but be on the look-out for the criminals among the residents and immediately, expel such from the community. Leaders of various units of the Police Community Relations Committee (PCRC) within Abeokuta, who were present extolled the commitment of FUNAAB and called on other communities and institutions to emulate it, in order to stamp out crimes within our campuses. They also thanked the CP for his approval and support towards the project. They described FUNAAB as a trailblazer, after playing a laudable role in the building of the Obantoko Divisional Police Headquarters years back; they were also the arrow-head towards the FUNAAB/Harmony Divisional Police headquarters. Adding colour to the day was the FUNAAB Students’ Union body, led by the President, Ayobami Popoola who presented Award of Leadership to the Commissioner of Police, and Award of Excellence to Hon. Taiwo Akinlabi, the Chairman, PCRC, Obantoko. Also commissioned was a patrol car for the Division and a Foundation Laying-Ceremony for the FUNAAB/Harmony Divisional Police Barracks.